As a freelance writer, Amanda Hervey knows how to tell stories. 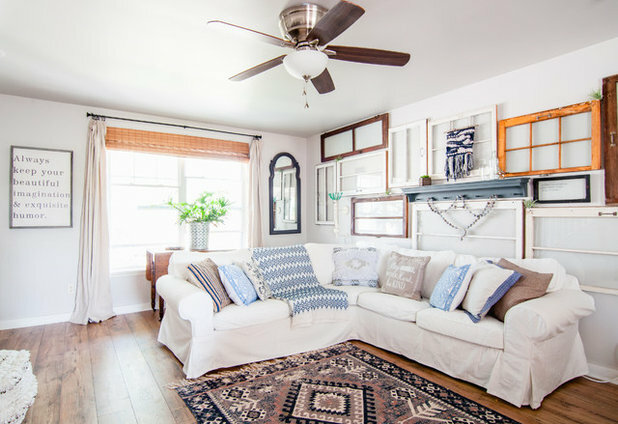 When she and husband Travis, a computer programmer, transformed their builder-basic home in the suburb of Georgetown, Kentucky, she found out that her favorite way of sharing her family’s story is through repurposing secondhand items into fresh, eclectic farmhouse designs. 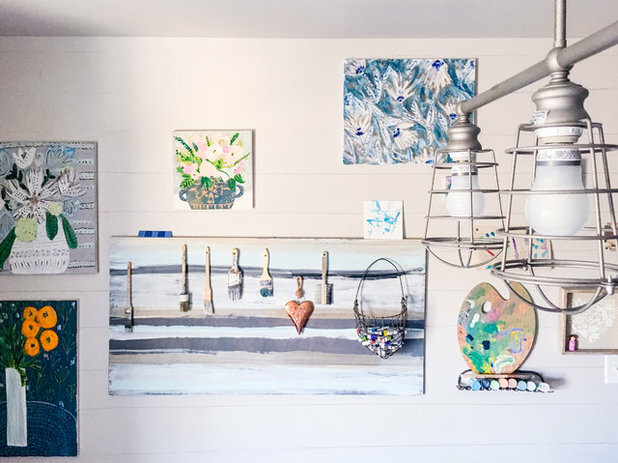 She shares her inspiring design choices and whimsical DIY projects on her blog, Our Storied Home, and encourages others to create the home of their dreams no matter what their budget or existing style might be. 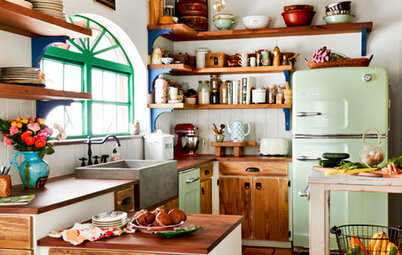 “The kitchen is certainly the heart of our home,” Amanda says. 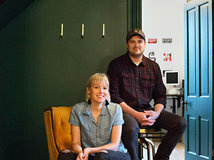 All of the kitchen renovations were DIY projects Amanda and Travis did by themselves or with the help of a parent. Travis and his father installed the countertop, and Amanda and her mother installed the floor. 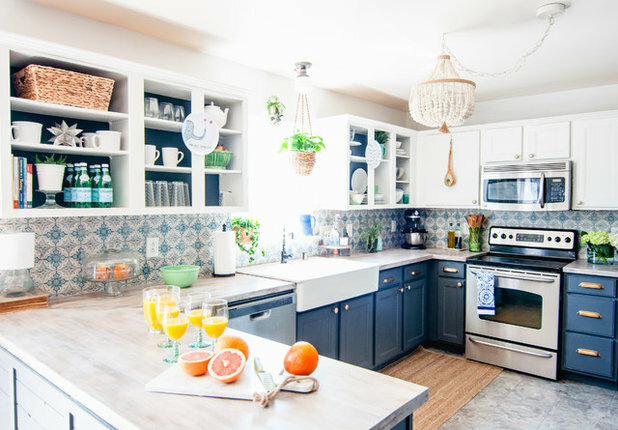 The couple also installed their own lighting, added a decorative backsplash and put in decorative planking on the kitchen bar. 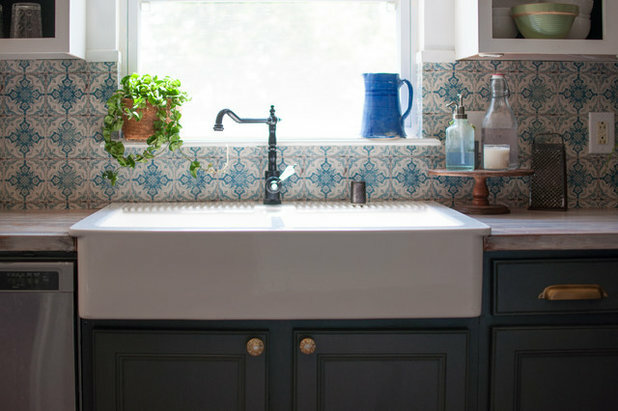 Shades of blue are a unifying motif in the kitchen’s eclectic design. 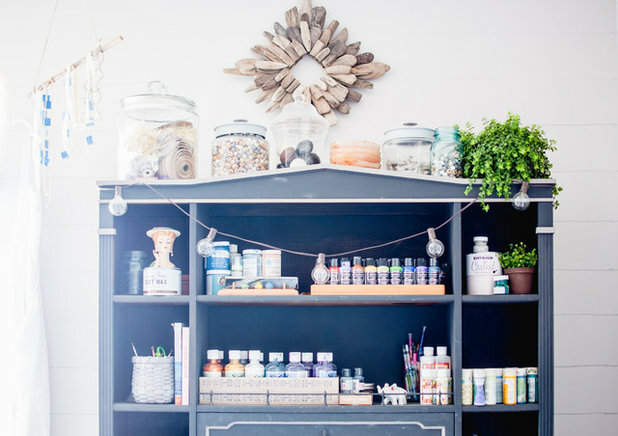 Amanda used chalkboard paint on both the upper and lower standard cabinets that were there when the family moved in. 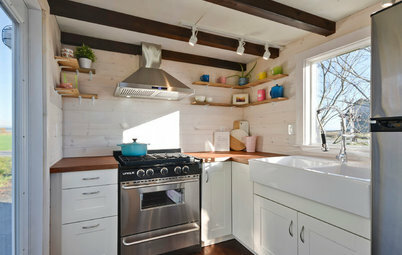 The farmhouse-style sink and faucet as well as the butcher block countertops are from Ikea. 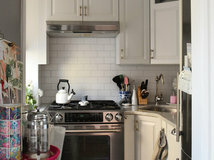 To protect the Anthropologie wallpaper backsplash, Amanda applied three coats of matte Polycrylic over the top of it. 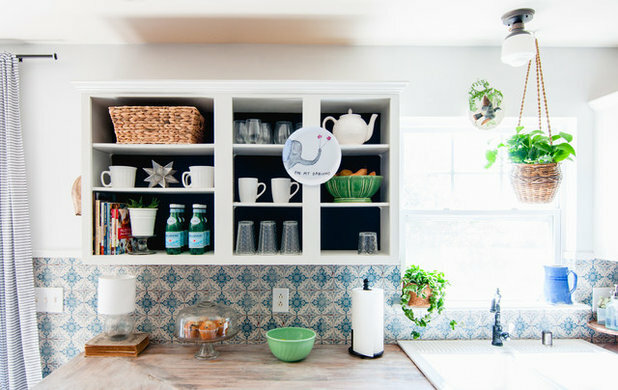 She also refinished the countertops for a limed-oak look and kept some upper cabinets open to put some favorite dishes on display, including a plate with a whimsical illustration. 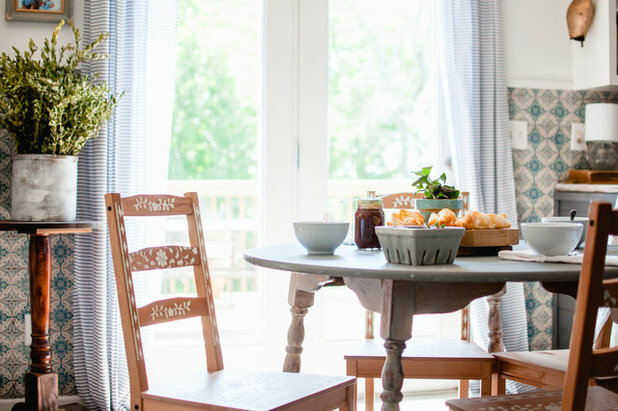 Amanda painted the family’s wood Ikea dining chairs using a stencil to personalize them. 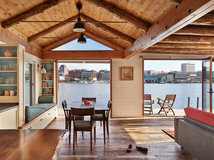 “From the outside, it is just a builder-basic house stuck smack dab in the burbs,” Amanda says. 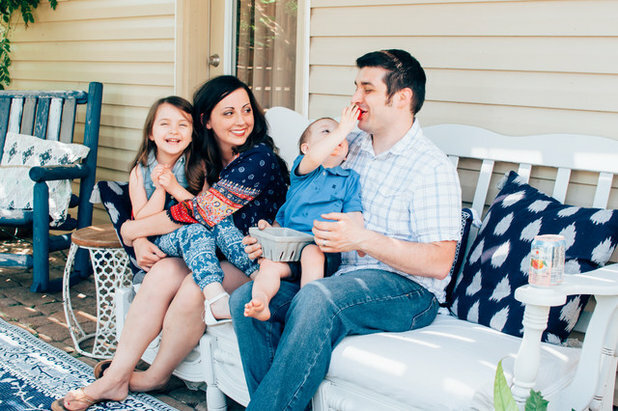 “We bought it because basements are unusual in this region and this house had one.” The Herveys knew that Amanda’s mom would eventually need to live with them, and the house gave them the opportunity to create a full apartment for her use. 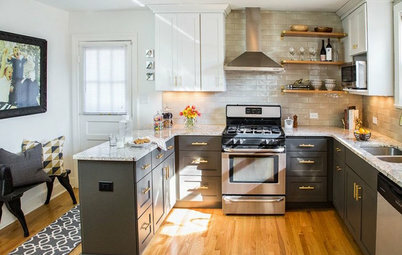 “So, from the street, it’s an ordinary house, but inside we actually have two full households with two kitchens,” Amanda says. 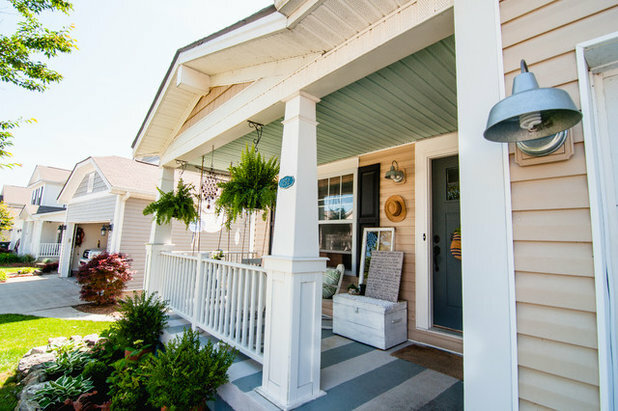 Amanda painted the porch floor with wide stripes and the ceiling Haint Blue, which is a popular practice in the South. The doily dreamcatcher panel, which Amanda created using embroidery hoops, gives the family a little privacy from the neighbors. 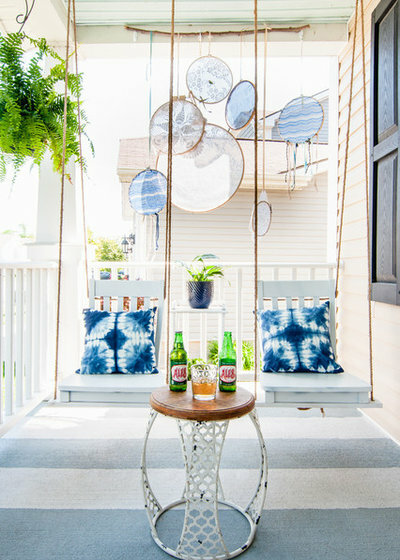 Another clever DIY project Amanda completed is the side-by-side porch swings she made out of kitchen chairs. 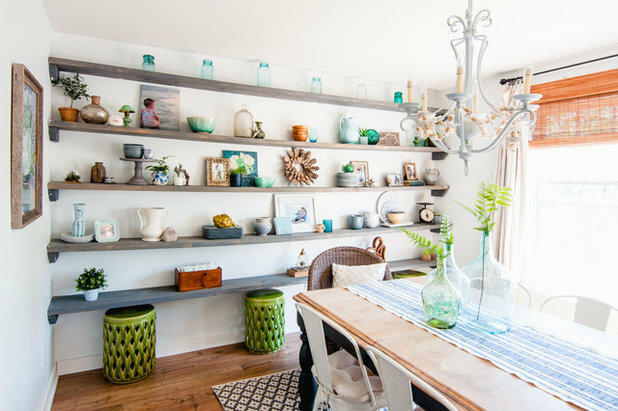 The DIY projects in the open dining room include the dining room table, chandelier and open shelves. Amanda also repainted the room and installed new flooring. 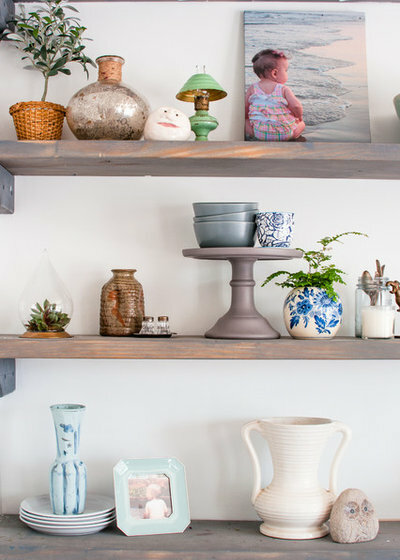 Meaningful heirlooms, family photographs and decorative thrift store finds are displayed on the open shelves. 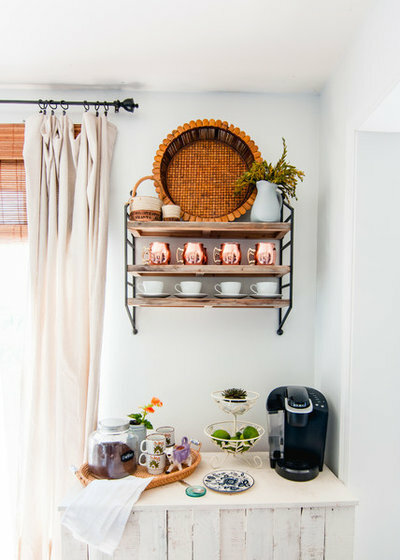 In the corner of the dining room is a station set up for preparing coffee and tea, which comes in handy when the couple is entertaining. 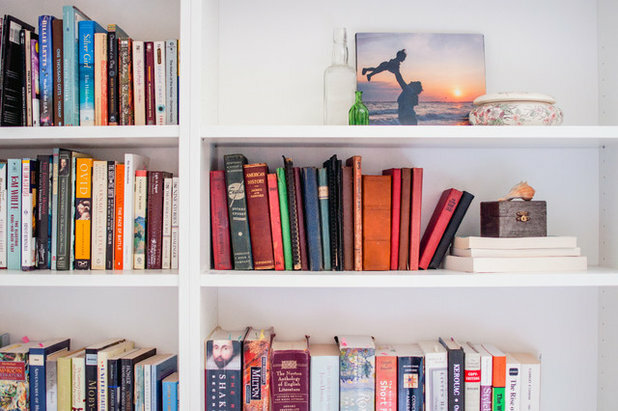 One wall in the master bedroom is devoted to the couple’s library. 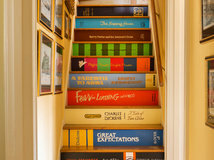 “Even if a house doesn’t have a rich history, it can be rich in story. My decorating style is very sentimental and often symbolic. I’m an English nerd — everything has a deeper meaning,” Amanda says. 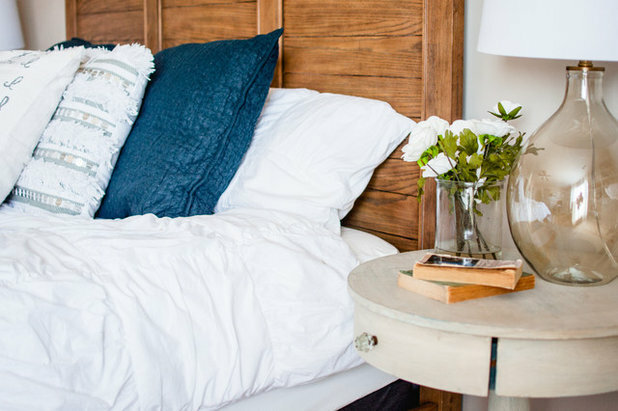 Books also overflow onto other surfaces in the master bedroom, such as the nightstand seen here. 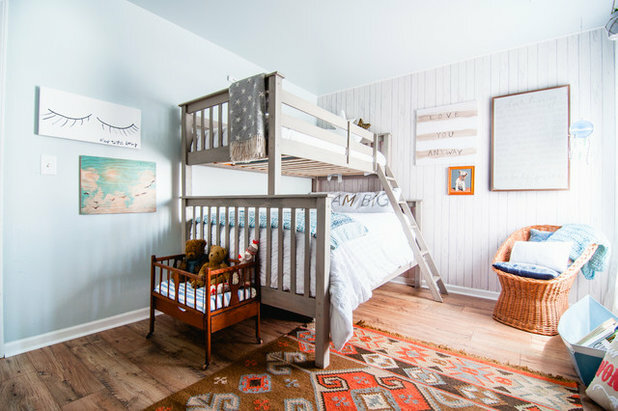 The couple’s children, Ada and Eli, share a room that Amanda designed in a gender-neutral palette. 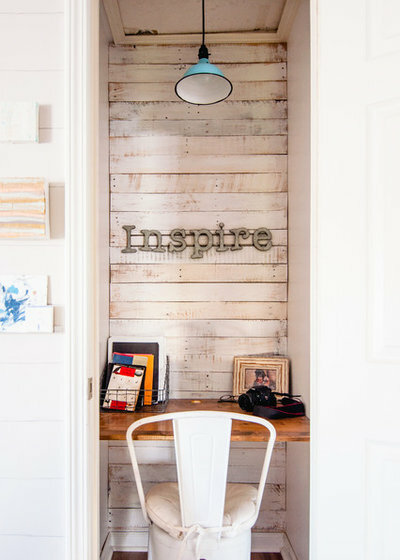 Typographical DIY art decorates the walls. 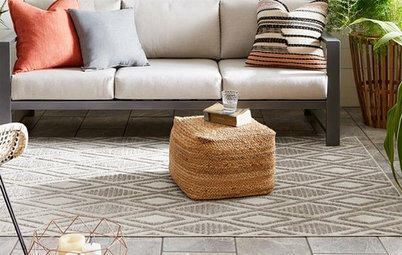 The wicker chair and bohemian-style throw are secondhand finds. Amanda and Travis installed new flooring and wallpaper and painted the walls. The book boat is a secondhand find. 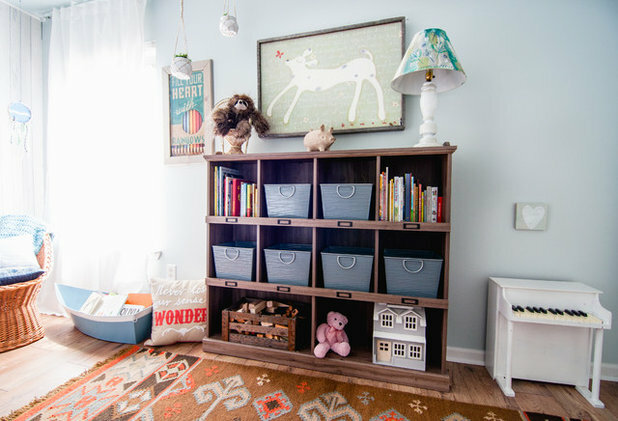 Amanda turned a hall closet into a miniature office where she could work, read and write posts for her blog, Our Storied Home. 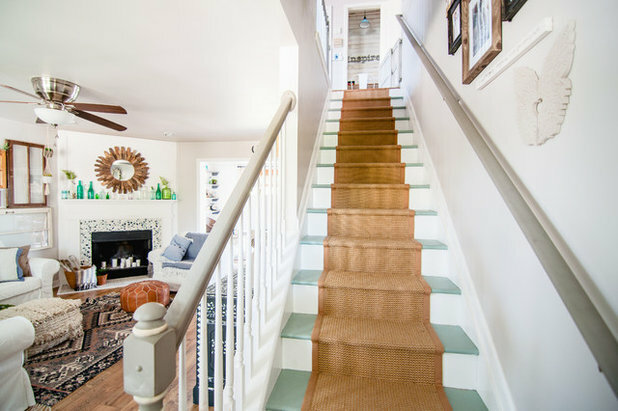 Of all the rooms in the house, the space at the top of the stairs has perhaps been adapted to the couple’s creative lifestyle the most. 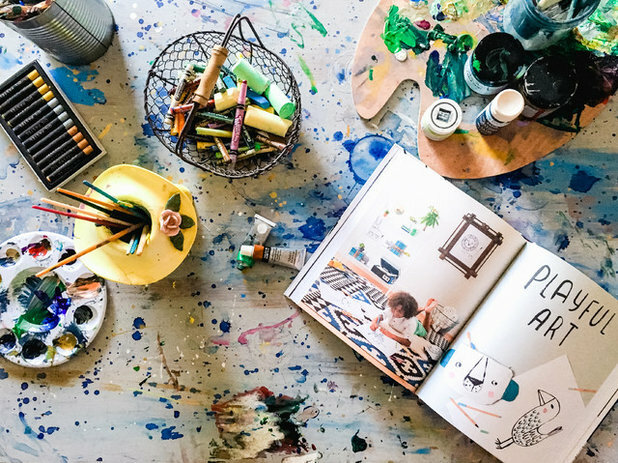 With the help of their children, Amanda and Travis turned the space into a family art studio. 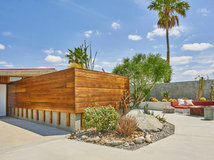 “Travis is very supportive of letting me work out my creativity on this house. As a writer, I feel very connected to my environment. I’m a sponge. If I don’t feel at home, I have a hard time feeling creative. He gets that and supports me,” Amanda says. 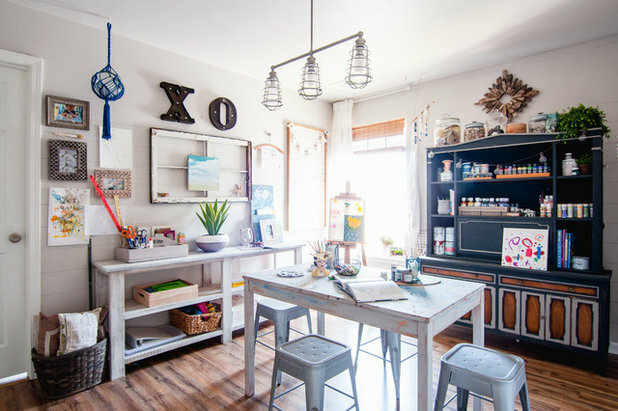 The work surface in her studio exemplifies her creative approach. 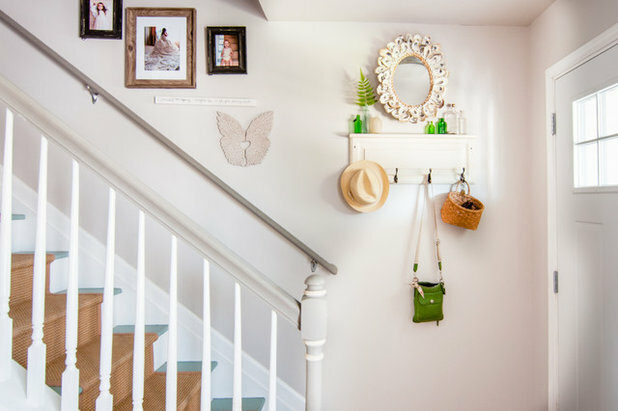 Lining the staircase wall is a gallery wall of pictures. 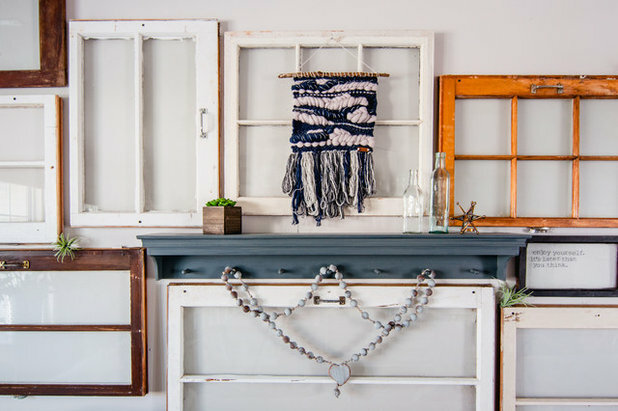 A shelf with hooks by the front door entry holds accessories and decorative items. 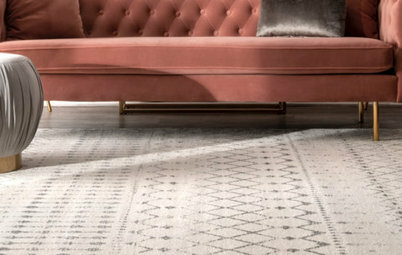 An assortment of patterns and shapes in the downstairs living room creates a playful visual energy. 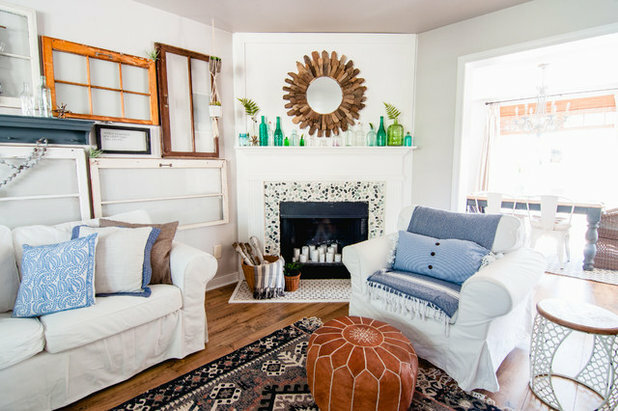 Amanda puts candles in the fireplace during the nonwinter months and lines the mantel shelf with green and clear bottles. 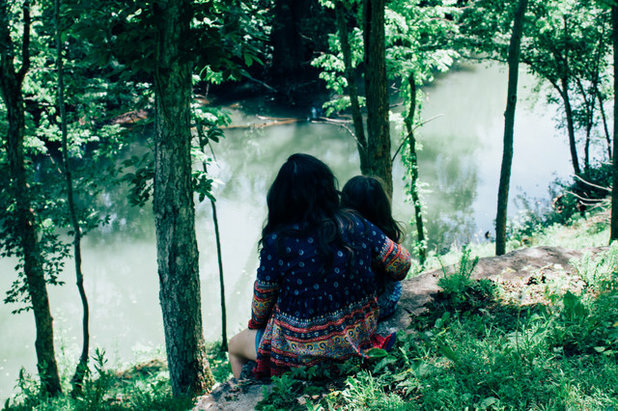 Here, Amanda and Ada sit in one of their favorite spots behind their home. 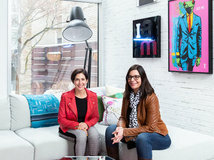 “We were more excited by the location than the house itself. We love being right on the banks of the Elkhorn Creek, which Walt Whitman wrote of in ‘Song of Myself,’” Amanda says. 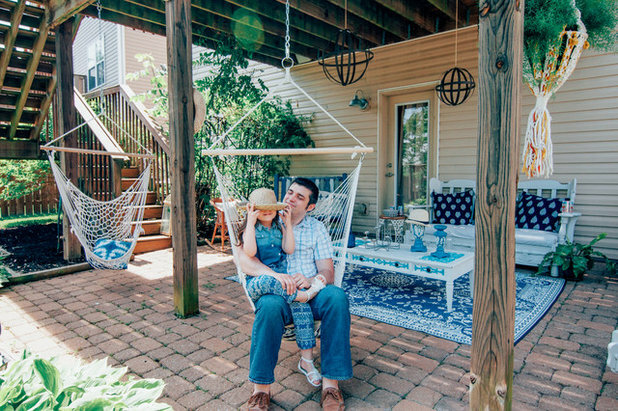 The family spend much of their time outside on the patio under their deck. Travis and Ada are seen here enjoying one of the outdoor swings. 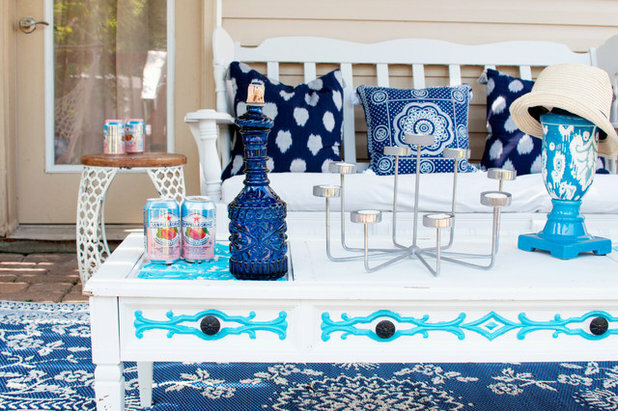 This outdoor space has become an additional room, filled with Amanda’s thrift store furniture and eclectic decor. Almost everything is hand-me-down, homemade or thrifted. “I might have a few dumpster-dive treasures too,” Amanda says with a wink. 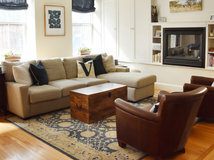 The Hervey family love how their house has become a gathering place for friends and family. 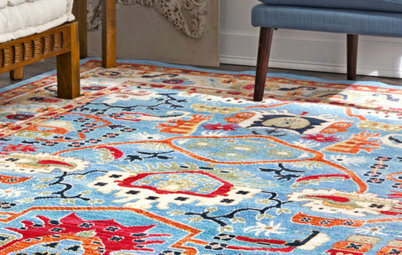 “My friends are my design army — we all have a little ownership over it. It’s home to a lot of wandering souls and strays,” Amanda says. 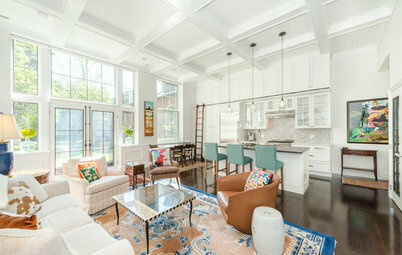 This home and this families lifestyle is truly inspirational in creativity and appreciating every gift and blessing in life and their home is infused with charm and personality because of this creativity! Beautiful! 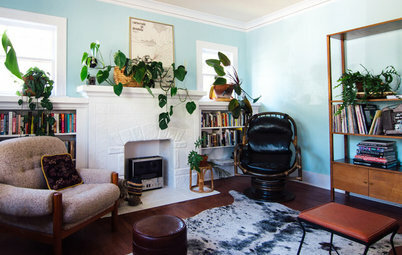 I have read this article on Houzz before and enjoyed so much reading it again. Definitely a fun home. 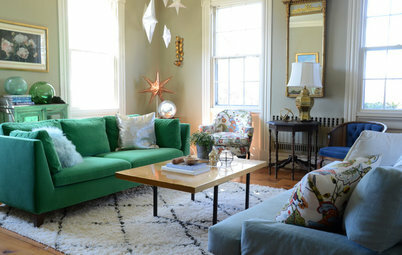 Love the story behind the old windows, and it totally meshes with my collection of old mirrors. I always think about the people who may have looked into them and the connection I now have with them. 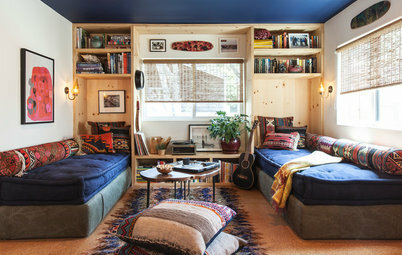 It is also great for enlarging my small, dark living room. I am in the midst of enclosing a "carport" and already have a collection of windows. Thank you for some much needed inspiration!